Did Gap really get it wrong? 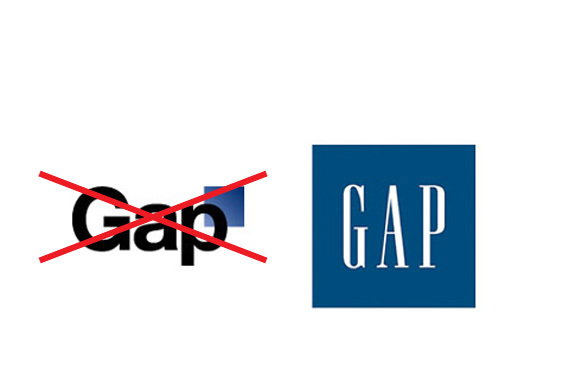 My initial thought on seeing the recent furore over Gap’s new logo was – did they do this whole thing on purpose? Gap is a huge, multinational company with a vast customer base. While it’s important to demonstrate a willingness to listen to your customers, typical ‘big brand behaviour’ involves a certain confidence and strength of image. Not making a complete u-turn in a matter of days over something as crucial as a brand logo, just because of some negative comments online. A closer look at the proposed new logo does nothing to negate this initial reaction. It looks a little half-hearted, as if Gap isn’t actually committed to making any major changes. A rebrand is a huge commitment, and one that no company, especially one as influential as Gap would take on lightly. We’re talking months and months of planning, creative input and production, culminating in a dramatic change that suggests the company is committed to moving forward and changing the way it is perceived. Holiday Inn’s recent rebrand is a good example of this. Gap’s new logo looked uninspired and thrown together. Subsequently opening the floor to disapproving customers and using crowd sourcing to design a new logo seems an odd decision, and one that has met with some adversity in the design community. There’s a reason that companies hire professionals to put months of hard work into their branding. It’s unlikely that a logo designed by a member of the public would have the same impact. I find it hard to believe that Gap could make all these fundamental mistakes without good reason. Over the last few days the company has been in every industry publication and had national exposure, as well as generating considerable word-of-mouth as the public campaigns to bring back the old logo. I predict that the old logo will be reinstated, and that this was the plan all along. Cadbury’s hugely successful Wispa relaunch demonstrated the power of the protest campaign as a brand builder. Let’s see if Gap can emulate this success. Hmmmm… you would *hope* it was a deliberate gambit / strategy for some much-needed exposure, but surely, way too risky? To be honest, I don’t mind the new (or is that now old) logo, but do prefer the old (or is that new) one. Someone must have had some Titanium Cojones if it was deliberate, but thinking about it as I write this, I cannot see the board of Gap condoning it. If this was all a very clever, creative marketing ploy, what did Laird & Partners get from it, apart from a tarnished reputation?